Some students will require special access. 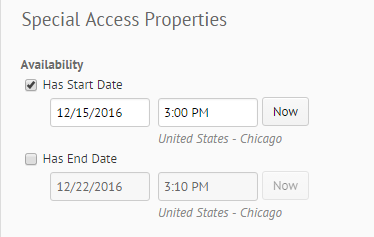 This includes having special availability, timing changes, and opting out of using respondus lockdown browser. Go to the Quiz that needs special access. Select the drop down arrow next to the Quiz and click Edit. At the bottom of the page there is an area for Special Access. Click on Add Users to Special Access. Select the students that you would like to have the Special Access in this quiz. Click the Add Special Access button. You can change the start and end dates as well as the times of a quiz's availability for the specific students requiring special access. You can change the time limit of the quiz. Either choose no changes, no enforced time limit, or enforced time limit. When selecting No enforced time limit, it then will prompt you with how long the recommended length should be. When selecting Enforced time limit, more options will appear. Put the new time limit in, assign a grace period if necessary, and decide what will happen with late behavior if you choose to assign alternative late behavior. There is also an option to not require the quiz to be in Respondus LockDown Browser for the students with special access. Check the box to not require LockDown Browser for the special access students. Note: This option is only available if the quiz already has Respondus LockDown Browser required. 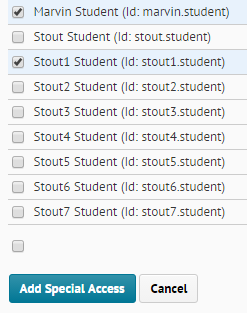 You can change certain students special access individually depending on their needs. To do this click on the pencil next to the students name. This will take you back into the special access properties for this student. You can then change their special access depending on their individual needs.